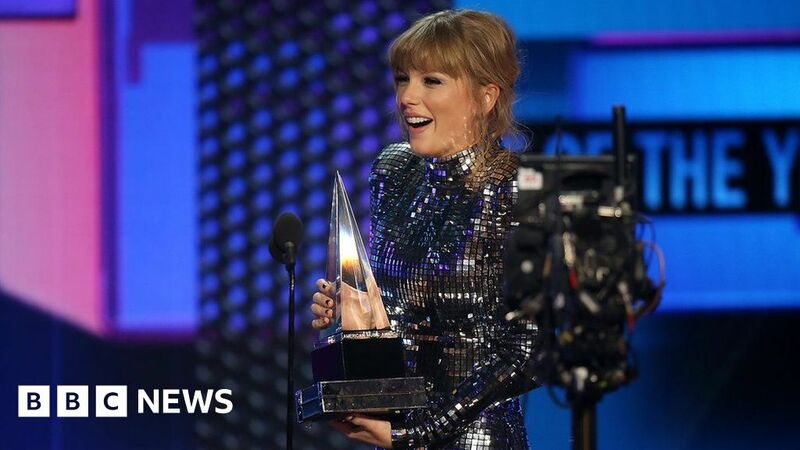 Taylor Swift not only opened the American Music Awards with a fiery performance of I Did Something Bad, but she went on to dominate the show. The star won four trophies, including artist of the year, making her the ceremony’s most-decorated female ever. She now holds 23 AMAs, beating a record previously held by Whitney Houston. Swift, who recently broke years of political silence to declare support for two Democrats, again urged fans to take part in the US mid-term elections. Accepting artist of the year, she said: “This award, and every single award given out tonight, were voted on by the people. Swift’s touring partner Camila Cabello also won four awards at the ceremony; while British singers Ella Mai and Dua Lipa gave show-stopping performances. Here are some of the best bits. Resembling nothing less than an explosion in a branch of Claire’s Accessories; Cardi B’s vibrant, multicoloured performance was stunning even before she wheeled Bad Bunny on stage in a shopping trolley. She went on to flex her leg over her head and ride a bicycle across the stage (sadly not at the same time) – leaving SNL star Taran Killam somewhat lost for words. They multiple award winners, but touring partners and BFFs Taylor Swift and Camila Cabello seemed to be more excited to spend a night in each other’s company. Who says women in music have to be at each other’s throats all the time? Meanwhile, Swift hinted she’d started work on the follow-up to Reputation. “I always look at albums as chapters in my life,” she said on stage. Rapper XXXTentacion, who was shot dead in June, was a pothumous winner in the best soul and R&B album category. His mother, Cleopatra Bernard, choked back tears as she accepted the award on his behalf. “I’m so nervous, you guys,” she admitted as she reached the stage. The R&B star has scored a viral hit with her new single – and she effortlessly kept up with the song’s frenetic pace with a pin-sharp, Rhythm-Nation-style performance. Backed by an army of dancers, it gave the show’s third hour a much-needed injection of energy; ramping up even further when Missy Elliot crashed the stage to deliver her verse from the song’s remix. Ciara then segued into another hit single, Dose, managing to incorporate a segment of BlocBoy JB’s “shoot” dance as she was surrounded by a marching band. “Now that’s how you do it,” said host Tracee Ellis Ross, as the singer received a standing ovation from Khalid, Camila Cabello, and Cardi B. With their third album poised to enter the charts at number one this week, Twenty One Pilots didn’t pull any punches with their performance of Jumpsuit. Singer Tyler Joseph remained uncharacteristically still for the song’s opening minute before throwing himself around the stage as the crunching bass riff kicked in. By the climax, the stage was ablaze, with a car behind the band bursting into flames. In a night crammed full of pop, it provided a rare opportunity for the moshpit to kick into action. Setting out her stall for next year’s Grammy Awards, Dua Lipa performed two massive house hits – One Kiss and Electricity – while being doused in UV fluorescent paint by a troupe of dancers. The stage recreated the warehouse setting of her Electricity video – itself a callback to Janet Jackson’s Pleasure Principle – while Dua prompted gasps from the audience by falling backwards from a 10-foot-high metal staircase. Luckily, there were some dancers ready to catch her. Aretha Franklin was a regular guest at the AMAs, as a host, performer, and winner – so it seemed fitting that the ceremony would close with a tribute to the star. Eschewing hits like Respect and Dr Feelgood, the performance focused on her gospel roots and her favourite hymns, including several from her best-selling 1972 live album, Amazing Grace. Gladys Knight opened the segment with a heartfelt rendition of Amazing Grace, before being joined by Mary Mary, Ce Ce Winans, Ledisi and Donnie McClurkins for a medley that included How I Got Over, Mary Don’t You Weep and Climb Higher Mountains,” which was used as the recessional song at Franklin’s funeral. During the performance, the cameras panned around to the audience, where Franklin’s granddaughter Victoria was watching in tears.